"The D'Fenders set a benchmark that was an example to all of us"
This group formed in Birmingham during November 1964, was originally known as The "Rockin' D'Fenders" but later changed to just plain "D'Fenders". This was due to a change in musical policy from hard rock to melodic close harmony numbers. The D'Fenders described here are not to be confused with other Birmingham outfits - "Buzz Allen and The D'Fenders" or, "The D'Fenders" (formerly The Kingfishers) of Cherrywood Road ("hello Len") Bordesley Green. The original line up comprised, Barry Dawes (bass/vocals), Ted Powell (drums), Rob "Fingers" Green (organ, harmonica, various brass wind instruments and vocals), Max "The Nub" Griffiths (lead guitar, sax, mandolin and vocals), and Ricky Terry (lead vocals and tambourine). Their previous groups were; Barry (The Astronauts), Max (The Wildcats Skiffle Group, Rhys Chequers and The Nightriders), Rob (City of Birmingham Youth Orchestra), Ricky (The Invaders, The Sabres, The Rebels), Ted (unknown). The D'Fenders were managed by Birmingham promoter Pete Gittins who owned Barr Enterprises and had a business partnership with Astra-Allen in Wolverhampton in promoting local and international artistes across the UK. I recall Max being most meticulous with chord arrangements and guitar parts with both detail and actual sound. Also, Rob "fingers" Green, so called because he was a virtual musical computer with an ability to wrest a tune out of any musical instrument. Most successful groups at the time had some sort of "musical professor" in their ranks and Rob was "it" for The D'Fenders! Rob had served his musical apprenticeship as a member of the City of Birmingham Youth Orchestra so he put this experience to good use with The D'Fenders by featuring French Horn, Tuba, Trombone, Organ and harmonica in their set. 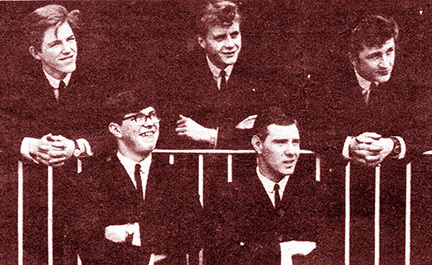 This incarnation of the group appeared on the front cover of Midland Beat in May of, 1965. 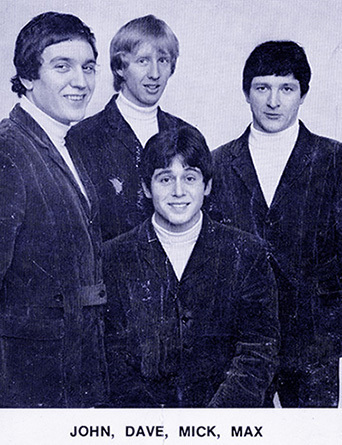 In May, 1966 they appeared yet again on the cover but, as a second incarnation of the group with Dave Thompson from The Traders and Guitars Incorporated (drums) and Andy Sterling from Zuider Zee (lead vocals). Whilst all this was happening two mates, Jon Fox and Keith Dolloway were leaving Johnny Neal and The Starliners to form a group known as The Few. Rick, Terry and Ted from the original D'Fenders (above) were to join forces with them. Jon Fox soon left The Few. The third incarnation of The D'Fenders saw the inclusion of Jon Fox (bass, vocals) and Mick Lawson (rhythm guitar, vocals) Jon had had his own popular group, Jon Fox and The Hunters and Mick was formerly with The Shanes. This line up was to do the usual "tour of duty" in Wuppertal, Germany but, was approached by Wolverhampton promoter Roger Allen who was in Germany with The Montanas. He asked Jon and Mick to form a group upon their return to the UK and he would sign them to both his and The Astra agencies (Astra-Allen) with a guarantee of extensive work and possible recording contract. "He took my Fender Telecaster apart, rewired it and got sounds from it that even Fender had never thought of"
Jon and Mick promptly sought out Brian Nicholls (lead guitar) who was with The Capitals (and ex Fleetwoods, Little People, Shanes) and Ken Horden (drums, vocals) from The Modernaires (ex Lawmen, Shanes) to join forces in the formation of Varsity Rag. As can be seen from the Midland Beat gig listings from Barr Enterprises, The D'Fenders enjoyed a prolific workload across the Midlands. As a covers band their dedication to accuracy was beyond question resulting in renditions of songs being at least as good as the originals. Max was a whizz when it came to equipment and guitars. At a jam session at Mick's house he took my Fender Telecaster apart, rewired it and got sounds from it that even Fender had never thought of. Afterwards, Max taught me some super jazz chords to 'The Lady is a Tramp' and me and Mick Lawson busked along with Max providing some pretty nifty Wes Montgomery style improvisation. We did this again a couple of weeks later when Max sat in with Varsity Rag for an impromptu jam session at The Rum Runner with club manager, Mick Walker as compere. Great memories! Max invested in sophisticated guitars such as the "Fender Jazzmaster" and "Burns Marvin" and used all of their soundscapes to full effect. Unfortunately, following a gig at The Sheldon pub in Solihull, a roadie whilst packing the gear away in the dark car park, drove off leaving the Burns on a wall and despite appeals it was never seen again. Ironically, in 1969, Max went on to replace me in Varsity Rag. A recording contract should not be the "be all and end all" of a group's existence but, surprisingly such an opportunity never came their way. Plenty of A&R men showed an interest but, whilst they were commended for their musical prowess they did not have songwriters in their ranks and hence... "no original material"
However, A&R interest was again evident when Mick and Jon joined the group - largely because of Mick's voice - but this time the band had run its course and hence, their lack of interest in continuing. No matter, The D'Fenders set a benchmark in professionalism that was an example to all of us. This bio was produced from personal recollections, archival information and correspondence with Jon Fox but, current whereabouts of most former D'Fenders is not known other than to say that Jon Fox went on to join The Way of Life who also performed pure rock 'n' roll under the name of "Fanny Flickers" who morphed into "Frazer Nash". Following all of this, he joined forces with former D'Fender Dave Thompson and friend Rod Godwin to form Cathedral finally ending up as a member of the hit Coventry group "Jigsaw". Mick Lawson formed a duo called "Evensong", toured America with Bruce Springsteen, and recorded a successful album titled Evensong which was re-released as a CD a few years ago. He still performs and records as "Emmitt Till". Dave Thompson is also still working as a drummer and drum teacher in Cumbria. All press images copyright: Dennis Detheridge (Midland Beat). D'Fenders flyer (Mick, Jon, Max, Dave) copyright: Pete Gittins (Barr Enterprises).